Small Business, Artists, Medical & Technology Start-ups. I take the trauma out of working with technology at a very good price. Whether your site is simple, or complex. I will work with you to develop your identity and engage customers. I will evaluate & price solutions appropriate to your needs. Your Domain Name and Hosting can be set up quickly and painlessly. Your web pages will be implemented with the most up-to-date format and styles. 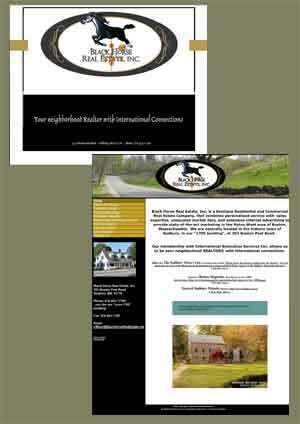 April 2009 - Sudbury, MA - Modifications to existing website for Real Estate agent to Home Page (to Match Postcard) and Multiple Listing Services pages with Seasonal Photos, assist staff with text updates. Need to communicate with an on-line form? Keep track of visitors, or provide access to "members-only" pages. Need a blog or a forum?